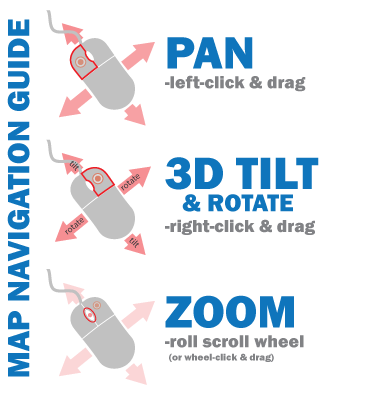 The 3D map responds to keyboard navigation keys (←↑↓→), as well as mouse wheel zooming and drag panning. If you have questions, don't hesitate to contact us by email or by phone at 801-537-3300. – Click to zoom in. Double-click or scroll mouse forward to zoom in at cursor. – Click to zoom out. – Click to zoom to the full extent of the geologic maps. – Rotate the map view between 3D angles. – Toggle between the three available basemaps. – Click to purchase hard-copy plots of maps at the Natural Resources Map & Bookstore. – Contact us with your comments and/or suggestions. – Switch click options between 1- identifying geologic unit descriptions and 2- downloading map data. – Search by map name to find maps using the keyword search. Partial map name searches are supported by default. – Use the slider to adjust the opacity of the geologic maps. – Instantly zoom to a location by entering a city, zip code, address, or lat/long pair. – Layer Manager and Filter Scale. Turn on and off scale layers (such as 1:500,000 statewide map or 1:24,000 detailed maps). Also you can click on the cog button to change the visible scale range for that layer. U.S. Geological Survey Historical Topographic Map Collection, scale 1:24,000. (1990 Edition).